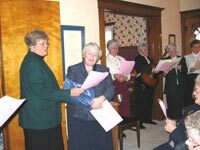 Sisters Dedicate House of Mercy in Heartland of U.S.A.
Left to Right: Sister Kathy Thornton president of the Cedar Rapids (Iowa, USA) Regional Community and Sister Sheila Carney, RSM, member of the leadership team of the Institute of the Sisters of Mercy of the Americas, join in song at the blessing ceremony of the Waterloo (Iowa) House of Mercy. The Waterloo House of Mercy was the seventh official house to open. Those already in existence are located in Erie, Pennsylvania; Chanmangua, Guatemala; Burlington, Vermont; Hartford, Connecticut; Baltimore, Maryland; and Benton Harbor, Michigan. Multicultural resident communities living a simple life of Mercy spirituality and hospitality in solidarity with the people of the neighborhoods. Ministries of direct service and empowerment, identified by and implemented with the people of the neighborhoods. Ministries of advocacy and systemic change, identified by and implemented with the people of the neighborhoods. Sisters already living and ministering in Houses of Mercy in other areas are pleased to report the neighborhoods have been most welcoming. 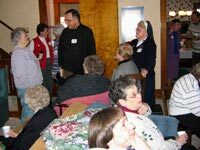 Typically, the Sisters become readily immersed in the neighborhoods, establishing family activities, evenings of soup and spirituality, study groups on racism, area beautification projects, political activities, and neighborhood organizations. 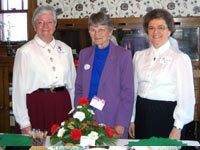 Left to Right: Sisters Rose Marie Martensen, Alice Maiers and Phyllis Ann Ries of the Cedar Rapids (Iowa, USA) Regional Community are the Mercys making the Waterloo (Iowa) House of Mercy their home. As this House of Mercy becomes a reality, it is yet another chapter in the history of the Mercys in the heartland of the United States of America, and indeed, the world.